YouTube continues to be unstoppable, and we are glad to see that more and more programs are available for fans to extract video MP3 music from YouTube. To help you with your decision, we look at the best tools for Mac and Windows (Win 10 included). Check out our full list of top YouTube extractors and learn to rip music from YouTube with original quality remained. For those who are looking for a speedy yet high quality YouTube video to audio converter, MacX Video Converter Pro cuts the mustard. The YouTube audio grabber is able to handle video in FLV, MKV, MP4, MOV etc. and rip audio music from 720p, 1080p, 4K UHD YouTube video at one stroke with zero sound quality loss thanks to High Quality Engine. It only takes a few seconds for the YouTube MP3 extractor to get sound from a YouTube music video. With frequent update, the tool fully supports the latest macos Sierra and Windows 10. With nifty interface, It is very easy to save audio from YouTube, just copy and paste video URL. Step 1: Free download the YouTube extractor for Mac or download Windows version and run it. Hit "YouTube" icon, copy and paste video URL to the box frame, and hit "analyze" button to load the video info. Step 2: Select YouTube video formats, resolution, file size and codecs. Step 3: Click "Browse" button to choose a destination folder to save the output video music movie file. Step 4: Click "Download Now" button to start ripping videos music clips movies from YouTube. Step 1: Run the tool, click "Add File" button to load video files saved on your computer. You can skip this step if you've selected "Auto add to convert list" when converting YouTube videos. Step 2: Select output format. To get music audio from video, head to "to Music". There are plenty of choices, you are allowed to rip MP3 audio from video, or rip AAC, AC3, M4A, OGG audio etc. iPhone Ringtone format from YTB video. The YouTube MP3 extractor offers ways to adjust audio quality and extract audio in 320kbps, 256kbps, 128kpbs with high quality. Step 3: Click "Browse" button to choose a folder to save extracted YouTube MP3 AAC audio music file. Step 4: Click "RUN" button to start ripping audio sound from YouTube video movie. 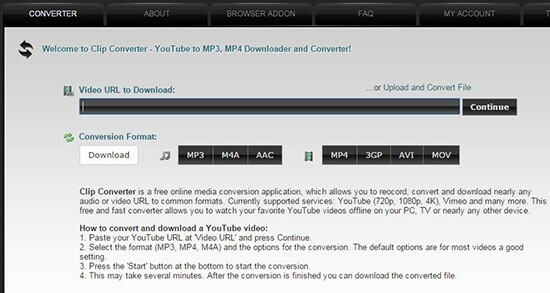 Online YouTube converter gives a very convenient solution to save sound from video. The whole task can be finished online without installing any software. But you should keep your eyes peeled as online programs comes with ads, plugins, malware and the likes. Every click may lead you to install any extra files programs to your desktop on sites. 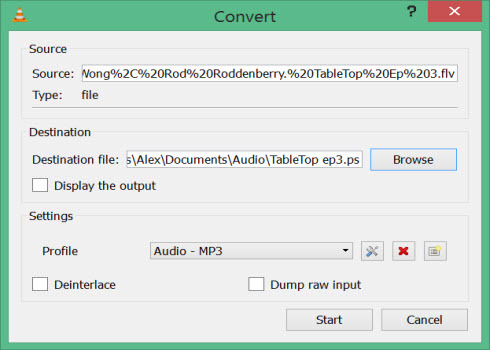 Clip Converter is a free online program, enabling you to save MP3 audio in a simple way. It supports downloading YouTube video in 720p, 480p, 360p or lower and convert it to MP3, M4A, AAC audio format and MP4, 3GP, AVI, MOV video format. It doesn’t give many choices in audio video formats, but performs comparatively better than other free online apps. 1. Copy and paste YouTube video URL to the box frame and click >Continue> button. 2. Select YouTube video resolution. Video with higher resolution is of larger file size. 3. Select "MP3" below the Conversion Format category. 4. Click >Start> button to start to extract MP3 audio from MP4 YouTube video. It may take several minutes to finish a music video to MP3 conversion process. Note: make sure that the file name extension is correct to avoid downloading any extra unwanted malware. In fact, some YouTube MP3 extractor extensions for Firefox Chrome also works great. YouTube mp3 is the one. The addon helps download MP3 audio from YouTube video by adding a button to the site. Users can click on the download button to download video in MP3 audio. It won't open a new page for the video to audio conversion. But the maximum video length is 20 minutes, which means theit doesn't work on videos longer than 20 mins. The best audio quality it provides is 128 kbps, which is quite poor for those who have higher demand on music audio quality. And some users complains that there's no button, mp3 not working sometimes. Another YouTube high quality audio grabber extension for web browser is YouTube to MP3 Free Converter. It is stable, simple to use and fast. The YouTube extractor offers no quality choice. If you want to get YouTube MP3 audio music in higher than 128kpbs, the tool will disappoint you. There is a redirection to spam site, be careful. It usually works fine, only sometimes, you'll get message like >whoops, something happened>, it may cause Firefox Chrome crash. There are some programs not mainly designed for extracting MP3 AAC M4A audio from YouTube, but capable of handling the task, they are media players. Some programs can convert downloaded YouTube videos, some have the ability to directly download and convert YouTube to MP3 audio. Let's cut to the chase, the program introduced here are VLC and 5KPlayer. It is a good idea to use VLC as a YouTube music ripper only when you have the media player installed on your computer and your YouTube video is downloaded. After all, VLC is not a professional YouTube sound extractor. If you want to convert YouTube to MP3 with more advanced settings, feel free to switch away. 2. Click "Add" to select and load the downloaded video, click Convert/Save. 3. In the Profile category, select "Audio-mp3" as output format, and click "Browse" button to save the output MP3 audio file. 4. Click "Start" button to start extracting sound from video. 5KPlayer has clear significant advantages over VLC in ripping MP3 from YouTube. As a smashing program for HD 4K UHD video music audio playback, 5KPlayer also works a treat as a YouTube converter. It downloads, converts YouTube videos and play extracted YouTube audio in MP3, AAC, AC3 etc. at a blow without stuttering. Note that the player only download YTB video to MP3 AAC audio and can not convert downloaded YouTube videos. Click "YouTube" icon on the main window, copy past YouTube video URL(8k supported), click "Download" button to download the video first, and then click "Convert to MP3" or "Convert to M3A", the YouTube audio grabber will get the job done speedily. A guide on how to extract audio from MP4, FLV, MOV, MKV, AVI with the top MP4 audio extractor is shared to help you rip audio from MP4 and other videos to MP3, AAC, iPhone ringtone as you like. Here's a guide on ripping MP3 from YouTube with ZERO quality loss. Learn 4 ways to extract MP3 audio from YouTube: use YouTube MP3 ripper software, YouTube to MP3 Android iPhone iOS app, online service, web browser plugins. 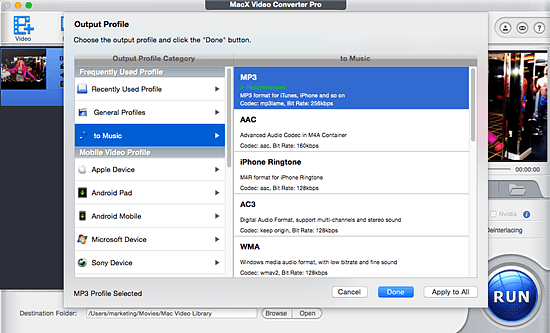 MacX Video Converter Pro is the best YouTube to iTunes converter, which can easily convert YouTube FLV videos to iTunes supported formats like MOV, MP4, M4V etc, along with excellent YouTube video download feature.